Want to count bumblebees? You’ll have to wait your turn! Mad as a hornet, a bumblebee buzzes her wings in vain against the walls of the vial holding her captive. She alights briefly on the paper tab indicating her number. Then she resumes scuttling around her plastic prison. Her warden is Shaina Helsel. 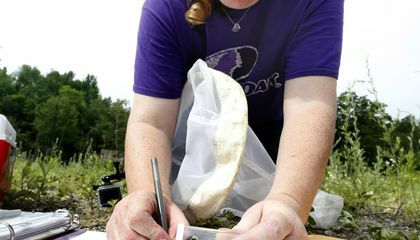 She is one soldier in a citizen army that is taking a census of Maine's bumblebees. It's an effort to secure the future of the state's blueberries, cranberries and tomatoes amid concern about the population of pollinators. "Time, location, elevation play a factor in what species are where," says Helsel. She is a biology student at University of Maine. It's in Augusta. "It's an interesting thing, going out and finding a bunch of different bumblebees. I've so far collected 105." The project is among a growing number of "citizen science" efforts around the country. They are designed to motivate the public to gather data about pollinators. The Great Pollinator Project of New York City tallied nearly 1,500 observations of the city's more than 200 bee species from 2007 to 2010. Across the continent, scientists and students at Washington State University also have tried to galvanize the public to collect data about bees. And more efforts are abuzz elsewhere. 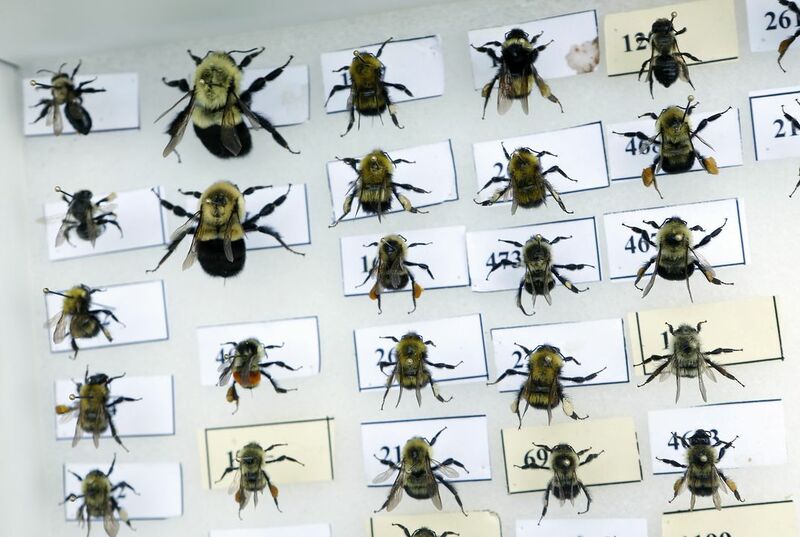 Maine's counting effort is called the Maine Bumblebee Atlas. It has a budget of about $50,000. The state has been using its website, press releases, newspaper announcements and social media to recruit volunteers. It's been wildly successful. The state has signed up 106 volunteers. It has another 150 in line and even had to turn people away from two booked-up training sessions, says Beth Swartz. She is biologist for the state Department of Inland Fisheries and Wildlife. Volunteers include bankers, teachers, students and retired paper mill workers, she says. There is everyone from tree-loving conservationists to "people whose professional lives are not anywhere near focused on the outdoors." The first training session for Maine's citizen scientists was in May. Another took place in July. The next will be in spring 2016. The project is expected to last five years. The residents collect "observational data" about bumblebees and their habitats. A specialist identifies the specimens they collect, Swartz says. The national conversation about bee die-offs has largely centered on honeybees. Those are different from the furry, chunky bumblebees. The Bee Informed Partnership said this year that about 5,000 beekeepers reported losing more than 40 percent of their honeybee colonies during a yearlong period that ended in April. The numbers are troubling because of the billions of dollars in value honeybees provide to agriculture every year as pollinators. Scientists have cited factors that could be accelerating honeybee deaths. They include parasites, pesticides and poor nutrition from a lack of diversity in pollen and nectar sources. In Maine, the focus is specifically on bumblebees. State officials say species that are in decline have suffered from habitat loss, pesticides and diseases and parasites introduced through commercially raised bumblebees. Maine has 17 known native bumblebee species. Four of them became rarely observed starting in the 1990s, biologists say. Data are poor on the status of the other 13. Officials say a multi-year statewide survey will better assess the population, range and abundance of the bees. The insects are key pollinators of wildflowers and some of the state's most important crops. Engaging the public to collect data about the bees is a step toward conserving them, says Swartz. Why are scientists motivating the public to count bees? I think that it is cool for people in Maine to start collecting bumblebees in public because people are collecting bumblebees to see also observe the bumblebees to see if they're still good or not. People might not like the idea of collecting bumblebees because if people caught a bumblebee, they will get stung by the bumblebee. Critical Thinking Question: Why are scientists motivating the public to count bees? Answer: I think the scientists are motivation the public to count bees so that they could see how the bumblebee pollination is going on while the bees are pollinating flowers for fruits which people are a lover of. Scientists are motivating the public to count bees so they can keep a steady flow of data on the fuzzy bugs who provide pollen to almost every kind of crop in the U.S and many other places. The scientists are motivating the public to send info in about bee population by saying how many blueberries ,cranberries and tomatoes we have are based on the number bees that can pollinate the. Scientists motivate counting bees because it can help the scientists study. Since their are more public citizens then the scientists themselves, if they ask the public to help count, it moves the project a lot faster. The reason why scientists are motivating people to count bumblebees is so they can see how many species there are, and to see how many are around at one time. Why the scientists are motivating the public to count bees is because it's an attempt to study the bumble bees population. we collect the bumble bees so a specialist can find the specimens they collect. Scientists are motivating the public to count bees because it would help save money and help conserve them and do charts to see if the population is growing or decreasing.